Ideally you should be able to use honey as an alternative to sugar in the endometriosis diet, but unfortunately honey can no longer be assured as pure and safe. You need to be aware of not buying contaminated imported honey, which can be diluted or contaminated with antibiotics and other chemicals. Also it has been found that some honey is obtained from bees that are using pollen from GM crops to produce honey. And finally, honey can be filtered so much during processing that there is no beneficial pollen left in the honey, thus leaving it with no nutritional value. Unfortunately this is a huge growing industry with vast amounts of contaminated honey being imported to the west from various countries. This article outlines some of the stark facts, following investigation, into the practise by large foreign companies in the honey business. Article extracts from: The Telegraph newspaper. A five-month investigation by the Seattle Post-Intelligencer newspaper found the international honey trade rife with criminal enterprises designed to take advantage of the demand for imports created by the mysterious collapse of bee colonies across America. According to the paper, large shipments of tainted honey from China have recently arrived at Western US ports after being repackaged as a product of Russia. Tens of thousands of tons of honey also enter the US each year from countries with few bees and no record of exporting honey such as Singapore and the Bahamas. Other shipments have come via India, Malaysia, Australia, Indonesia, Thailand and even Poland. The smugglers aim to avoid the health checks, tariffs and import fees imposed on foreign food products that deliberately undercut US domestic prices. The US Food and Drug Administration is cracking down on honey launderers amid fears that dangerously contaminated honey could slip into the US market and harm consumers. Efforts to tackle honey laundering have also been launched in Russian, India and Australia. The concern about Chinese honey stems from the use of a toxic antibiotic to fight a contagious bacterial epidemic that raged through hives across China in 1997. The outbreak reduced the country's honey production by two thirds. So which honey is safe? The only safe honey to use in your diet is pure, certified organic honey that has been produced using bee colonies that are not obtaining their pollen from GM crops. You need to do some research with suppliers to ensure that the honey you use is safe and is not contaminated in any way. 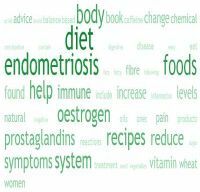 To ensure safe and healthy recipes in the book – 'Recipes & Diet Advice for Endometriosis' – it only includes honey in one or two recipes, and suggests various alternative sweeteners you can use.